WhatsApp has been at the top for being the best IM apps out there in the market and we are getting constant updates to it. Recently WhatsApp has added quite some new features in their Windows Phone edition and we are gonna reveal them.The new features of WhatsApp for Windows phone in the upcoming new update is revealed. The new features include quite some good features. Share a precise location: Now you can share your more precise location, which will help your friends to get your pinpoint locations and reach you in a easier way. Add captions to photos and videos: This is some kind of feature we have seen in Facebook’s Messenger app, while sending a photo to your friend you just add a caption to it. Till now, when you couldn’t express everything g via a picture on WhatsApp, you would type in something in the next message you sent, but not now. Just within a few weeks, you will get that too on WhatsApp. Before sending any photos or videos, you can add captions to them for a better understanding. Crop and rotate photos: Earlier, you had to crop images to remove the parts which you dodn’t wanna send using a photo editing app and then you used to send it. But in the next version of WhatsApp rolling out, you can also crop and rotate photos directly while sending instead of first doing the same using any photo editor. You can archive chats and groups: Now, you can also archive your important chats and groups, which is great for some people who switch between different smartphones. 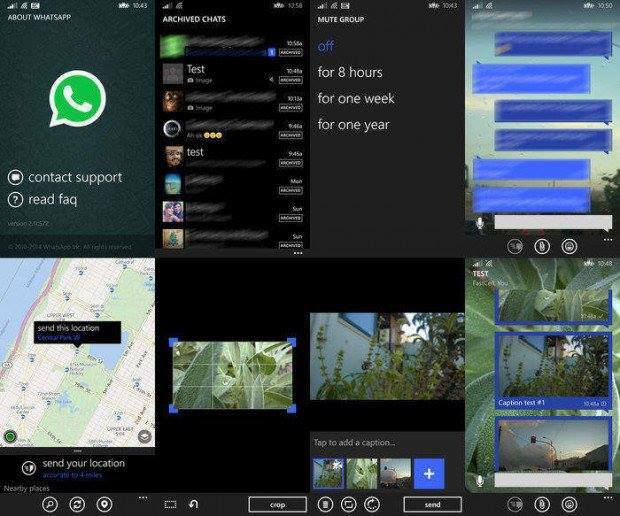 Many of these features are already present in the Android version of WhatsApp. But finally Windows phone users are also getting these features slowly. So, hopefully Windows users will get regular updates for performance improvements and battery efficiency.